My recent render was timed-out and would not complete because OOPR stalled at "Precomputing Irrandiances". This froze my entire computer for an hour until the time-out message appeared and I could stop the render. I have checked the model thoroughly and there are no warnings in the analysis. It was an updated model and both the old model and the individual updates render just fine but will not render together. Any insight? This is a client project so some urgency. Can you upload the model? How big is the model, what hardware do you have, and what does the analysis say? Thank you bigstick; the model 86 mb but I have not had a problem with models this size (and larger) before. Analysis is fine too. Lynn, this is probably an out of memory issue, I just tried it on our dual-Xeon and memory usage climbed to over 100 GB during precomputing irradiances before I cancelled it. It's not the point lights, I already tried turning them off. There is an LEM material on over 19,000 faces though (Material 33), I wonder if you accidentally put light emitting properties on something that shouldn't have had it? Update -- It doesn't seem to be the LEMs either. But this is something specific to the model or file. Update 2 -- It's very odd... I moved the camera a little bit and tried again and it rendered perfectly! Went back to "Scene 25" and it got stuck at Precomputing Irradiances, just like before. So there is something about that scene/camera. But try moving a little bit foreward and it hopefully it will work for you. As Justin has hinted at, it’s not the size of the model, it’s the complexity, and the number of calculations that need to be undertaken for the render to complete. Model size is not a particularly good indication of complexity. For example you can have a model with millions of faces which is just 20mb because everything is componentised and uses small textures. Explode the components and use larger textures and you can multiply the file size ten times! Also the number of lights, reflective and LEM surfaces has a massive effect on render time. If for example you have a lot of chairs with curved chrome rod legs, several levels of overlapping transparent planes and lots of lights, you can pretty much increase render time by perhaps 5 times. Calculating direct and indirect lights with lots of reflected surfaces through multiple layers of transparency gets very, very complicated. You should almost never have 19000 LEM faces in your model! They are for simulating light sources, and you should use them sparingly. If you are using lots of instances of a light fitting that has lots of LEMs, you migt want to try to optimise it to avoid problems. The first ting to do if a scene doesn’t render is use the Analyze tool and see what you are dealing with. If it tells you there is an extraordinarily large amount of LEMs or light fittings in the model - warning bells should start sounding. These are going to be problematic. Does this model have components from the 3d Warehouse in it? We have had all sorts of problems in the past caused by rogue components from there. A couple of years ago I had a model where the camera view never matched the model (it was way off) and there was a lot of missing geometry. The problem turned out to be a problem texture in a 3dw component. I fixed it and everything was fine. It took me a long time to isolate the component though. This illustrates the kind of unpredictable weirdness you can get with badly-modelled components. I would guess that a good 80-90% of 3dw components are badly-modelled! Thanks for the informative reply bigstick. I have found that increasing the number of facets to a curve yields a better visual but it also can create many faces when the item has a complex curve - such as the flame-shaped light-bulbs in the chandelier. That was definitely an error in modelling that I will not make again. The item that I imported from the warehouse was the shell moulding in the niche and I have discovered what you are referring to about the warehouse and I make it a habit to check 3dw items. I also think I need a stronger computer!! I will obtain more RAM and see if that affects the speed as it did take an hour for the model to render, even with the light bulbs simplified to an LEM plane. Thanks again for your careful attention to solving the problem. If you have made the entire bulb an LEM - don't! The bulb is the glass, the glass doesn't emit light. The LEM should simulate the actual light source ie the filament. Just 6 triangles. It's an effective way of replacing an omni light - if you don't want to use an omni light. 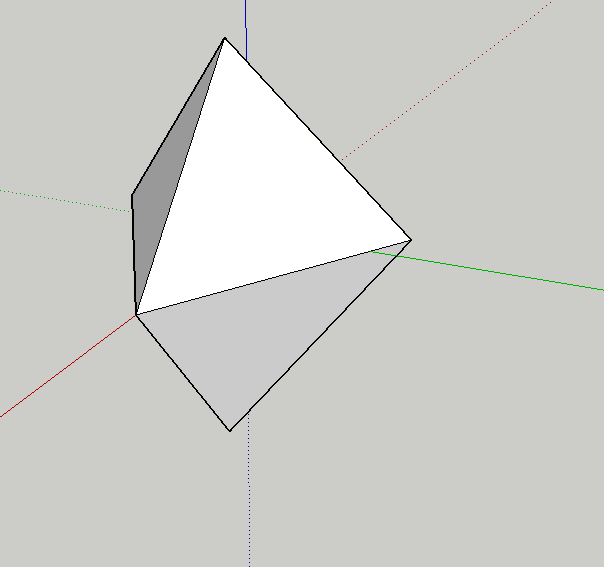 LEMs are always triangles in our render engine. Every rectangular LEM is triangulated, so this shape is the equivalent of 3 rectangles. Interesting! I will try it to see the results. I did not use glass; I selected a light colour and applied a value of 3 LEM to it. That probably slowed my model down. I have found inserting an OMNI into a glass bulb does not work as well as painting the bulb in LEM.